Acne is not just an embarrassing teenage problem. It can be caused or worsened by certain medications or cosmetics, exposure to industrial products like cutting oils, and can even be hereditary. Acne can affect people well into their adult years. If you are looking for natural and organic products to treat your acne prone skin, here are reviews of five facial cleansers that might be a good choice for you. They are all available on Amazon.com and all are highly recommended by current users. It’s made from natural ingredients that clean pores and soothe inflammation caused by acne and other skin conditions. It contains aloe vera that is rich in several vitamins and minerals to help with hydration and cell growth, making your skin softer and improving its natural glow. The aloe vera and St. John’s Wort and Dandelion Root all have anti-bacterial and anti-inflammatory properties that target bacteria that causes acne, reduce redness and inflammation, promote healing and help firm your skin. The face cleanser also contains Tea Tree Oil and Goldenseal, which are anti-inflammatories. They both have anti-fungal and antimicrobial properties that are good for cleaning the skin and healing open wounds. They can also help reduce skin irritations. The Pomegranate Seed Oil contains an omega-5 fatty acid that is effective against harmful UV rays and helps improve your skin’s texture. It is also good for ageing skin. The Burdock Root helps increase blood flow for improved skin texture and helps reduce wrinkles. Salicylic Acid helps unclog pores and removes dead skin cells, which tightens the skin and improves its texture. 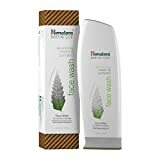 It receives high reviews from users for clearing up acne and other skin blemishes, with many reporting that it has worked better than other topicals and washes, even those recommended by a dermatologist. They also like the fresh tea tree scent. This daily face wash by Himalaya Botanique was made to cleanse oily and acne prone skin without leaving it dry. It uses organic neem, also known as Indian lilac, and turmeric to gently purify your skin and leave it smooth and radiant. Himalaya Botanique uses all-natural products that are organically grown and do not contain any synthetic ingredients or artificial colors or fragrances. They use high-grade cold-pressed oils that are hand extracted to preserve the natural nutrients. It contains natural vitamin E that moisturizes and softens skin and aloe vera and honey that also moisturize and improve your skin’s elasticity. The winter melon and bael fruit help wash away impurities, allowing your skin to breathe. They also help keep your skin supple. The face wash also includes English Lavender Oil and traces of natural clove and cinnamon to leave your skin feeling fresh and invigorated. It has a mild spicy scent and leaves a little tingle on your skin. Users report that this cleanser has been effective at clearing up acne and dermatitis that prescription medications and more expensive cleansers were not able to cure. They also report that their skin feels soft and looks more even in tone and texture. Tree To Tub’s acne face wash was developed for oily skin and skin that is prone to acne and blemishes. It uses organic Soapberry to help maintain your skin’s natural pH balance. It effectively removes makeup and deep cleans, leaving your face feeling fresh. 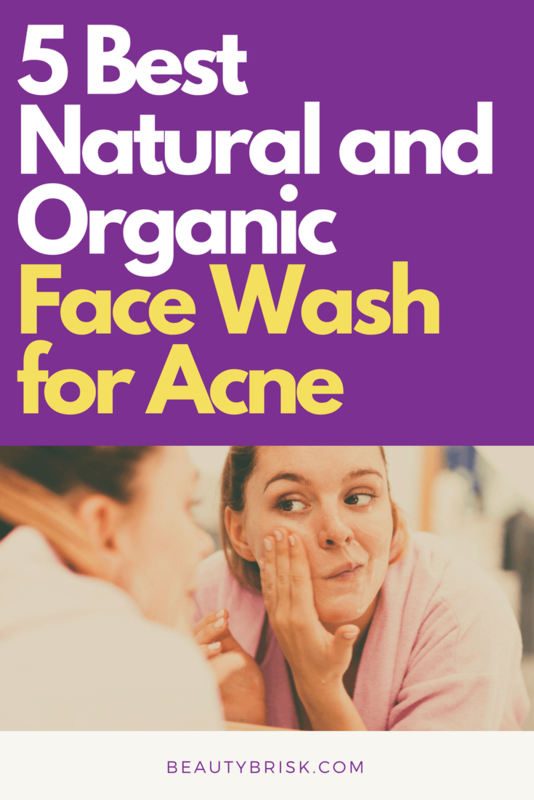 This face wash is made of all-natural products and has been recommended by dermatologists for being hypoallergenic and gentle on your skin. It is gluten free and is free from all chemical and artificial ingredients and fragrances. It is Certified Vegan and Certified Cruelty-Free and is never tested on animals. The Soapberry is sustainable harvested in Taiwan, dried in the sun and separated by hand before undergoing a sustainable extraction process. 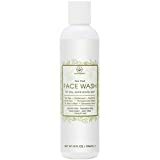 The face wash has chamomile to provide a calming effect and lavender essential oil for relaxation. The aloe vera and acai are hydrating and nourishing and deliver natural antibacterial and antifungal benefits. The face wash also contains shea butter that helps pores stay clear and moisturizes the skin. The shea butter has natural antimicrobial properties that can help reduce acne scars. It receives high marks from users for helping to relieve acne, rosacea and oily skin. Users also report that it is gentle on sensitive skin and leaves their faces feeling clean and soft. This facial cleanser from Clay Lotus is formulated to clear up blemishes and acne prone skin and to help reduce oily skin. It is made from 100% natural and certified organic ingredients and is also certified vegan and cruelty-free. The cleanser contains 23 natural and organic ingredients such as coconut oil, olive oil, aloe vera, neem oil, tea tree oil, eucalyptus oil, chamomile oil and turmeric oil, that provide antioxidants, vitamin A, vitamin C and vitamin E.
Its benefits include controlling shine and freshening dull skin to provide an even skin tone. It also soothes irritated skin and reduces inflammation caused by acne and other skin conditions. The antibacterial properties found in ingredients like aloe vera fight acne causing bacteria. 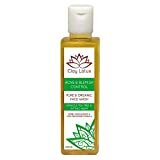 Clay Lotus notes that the coconut oil can make the face wash appear cloudy and cause it to solidify when cool. They recommend storing it at room temperature or putting the bottle in warm water to clear it and melt the solids. Users report very positive results at clearing up acne and blemishes and for leaving their faces feeling clean and fresh. Users also report that it reduces oily skin. The fresh scent from the natural essential oils is also receives positive comments. 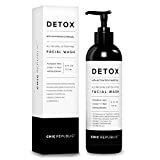 Chic Republic’s Detox facial cleanser provides a deep clean that reduces acne and other skin conditions. It detoxifies your skin to leave it looking younger and healthier. It is made in the USA of all-natural ingredients, is hypoallergenic and cruelty-free. The activated charcoal targets clogged pores to draw out toxins and impurities trapped deep in the skin. It exfoliates dead skin cells to leave your skin soft and smooth while balancing your skin’s natural oils. Its antimicrobial properties treat and prevent skin infections. Chic Republic uses a combination of three tea extracts, Rooibos Tea, White Tea and Green Tea, that work together as an antioxidant and protect your skin from damage caused by environmental pollutants. It is rich in vitamin C and vitamin B5 that target inflammation and promote healing. The natural coconut oil, orange peel oil and aloe vera help hydrate and firm your skin. The aloe vera also has antibacterial and anti-inflammatory properties that alleviate acne and blemishes. It receives high reviews from users as being effective against acne and oily skin. They also report that it is gentle on sensitive skin and leaves their skin feeling clean and moisturized. These five facial cleansers receive high grades from current users for effectively treating acne and reducing oily skin. They also help moisturize your skin and improve its tone and texture. One of these could be the right facial cleaner for you if you have sensitive skin or suffer from any condition that leaves your skin red, irritated or just dull and uneven in tone. These products are all made from natural and organic ingredients so you can feel confident that they will not be harsh on your skin.